To everything, there is a season. Elmer understands the rules and knows that there is a time and place for everything. 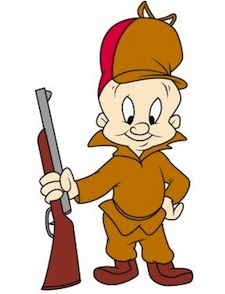 When wabbit season is over and duck season begins, Elmer makes the necessary adjustments and abides by the law. Sportsmanship is more important than winning. Elmer won’t use illegal or unfair means when he hunts his prey. He always gives Bugs a fair shake, and when he comes up empty, he simply goes home to hunt another day. Dress for success. Elmer wears the right gear for the task at hand. His preparation for hunting season includes proper headgear, footwear and clothing. Sometimes he even uses camouflage to track his prey. He’s a hunter with compassion and a heart of gold. Elmer may mean to hunt Bugs and Daffy Duck, but he’s always sorry whenever he thinks he’s hurt one of them. You get the feeling that he really isn’t up to actually killing the game he seeks. Deep down he’s just a softy. It’s good to take a break from work on occasion. “West and we-waxation at wast!”, says Elmer. He knows when it’s time to regroup and get some much-needed rest from his work. He knows he’ll need it if he ever expects to nab that rabbit. The virtue of being a good provider. As reluctant as he may be to actually kill an animal, Elmer does what he needs to in order to feed his family. Whether it’s duck, or Thanksgiving wabbit, Elmer faithfully sets out to bring home the proverbial bacon. You should never trust strangers. Poor Elmer is always getting duped by Bugs and his tricky disguises. Elmer should now better than to be so gullible, but he’s just such a trusting soul he just can’t help but get pulled in. It’s good to have a variety of hobbies. Elmer demonstrates his classical musical prowess in What’s Opera, Doc? It turns out that old Elmer is quite the operatic prodigy, thus teaching us a valuable lesson in diversity and culture. Hard work eventually pays off. In the cartoon titled Hare Brush, we learn that Elmer J. Fudd is a millionaire, who owns a mansion and a yacht. He’s obviously done something right over the years. When he isn’t hunting, it turns out he’s an industrial tycoon.